Leap is one of my favorite books by Williams. 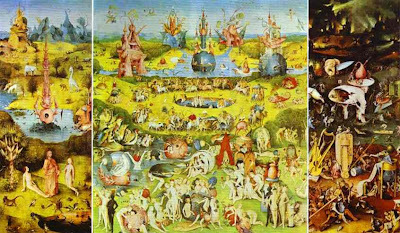 It is her personal journey through the landscape of this painting, The Garden of Earthly Delights, by the 15th c painter Hieronymus Bosch. There has been much speculation about this painting since that time which she explores throughout the book. However, being a naturalist and passionate advocate for the Earth, Williams’ interpretation is a tour de force that brings together faith, art, and history to awaken our senses to the beauty, to the sensuous world around us…that is present right here, right now. 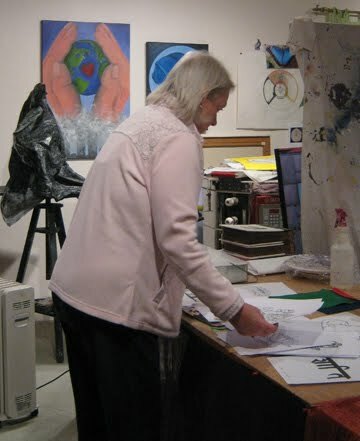 If you have read any of this blog you’ll know that this is also the heart of my life and work as an artist. 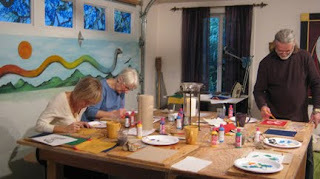 Art in service to the Sacred, the healing of the earth. I have been so inspired by Bosch’s painting and Williams account of it, that I have been at work on my own version of “The Garden” in the form of a mandala at the center and two outer panels. It has been slow going as I listen to the call of the muses and the creatures who are asking to be included in this piece but I’ve had a breakthrough in the last couple of days and look forward to sharing what emerges. I believe we all have a soul path that we are born to make manifest in this world. For me, as a young child I liked to draw and had a desire towards art before I knew what that meant. As a teen, I wanted to join the Peace Corp and be of service to others. Later, I studied sign language and wanted to teach deaf children. (None of these early aspirations were encouraged—as viable vocations—by my family of origin.) As a young adult, I found myself supporting friends, lovers, and co-workers through the vicissitudes of life, love, and often much drama. Recently, I have been reflecting on my near-death experience from appendicitis when I was sixteen. Had it not been for visiting family friends, who encouraged the emergency room, I may not be here today. We’ll never know for sure, but my appendix ruptured as I lay on the operating table. On an unconscious level, I believe that experience likely altered, or deepened, my orientation to life and purpose. Later, on the eve of my thirtieth birthday, I was ravaged by the loss of my brother, mother, best friend. Family. After the initial descent into the dark night, my heart broke open to the world. I was reborn again in many ways. To compassion. It was a long journey home and by no means an easy one but I’m grateful for the wisdom that emerged out of that long transformative passageway. Ultimately, it opened a pathway to service offering AIDS education/outreach and later facilitating grieving children at the Dougy Center here in Portland. It also created space for me to emerge as a spiritual artist and to answer the call of Spirit to manifest beauty in the world. I’m sharing my personal story here to illustrate what I believe to be a universal truth…that we each have a unique calling in life and to encourage others to listen deeply to that inner guidance, even when no one around you affirms it to be so. I remember a few voices from the past including my late brother Richard and others who often didn’t really ‘know’ me, strangers in fact, who reflected back to me my potential and what they saw ‘in me’ that was possible. It made all the difference and gave me confidence to follow the muse where ever she would lead me. In 2002, Spirit guided me to environmentalist and Buddhist scholar, Joanna Macy. And to a ten-day despair and empowerment intensive that broke open my heart to the suffering and beauty of the world which was, in every way, a spiritual homecoming to my place in the web of life. At the close of our training, we were invited to speak aloud and declare these Bodhisattva vows for the healing of our world. These vows are what continue to guide me in life, in my work, and in my HEART. For love of the EARTH, Pachamama. To support each other in our work for the world and to ask for help when I feel the need. To pursue a daily spiritual practice that clarifies my mind, strengthens my hart, and supports me in observing these vows. I’ve been reading the late Thomas Merton’s Love and Living of late and found his words of wisdom to be profound. In a world where work and material wealth are most often our primary indicators of ‘success,’ it is love–loving and being loved, that I believe is the true measure of our wealth. What a different world it might be if love, not money or fame, was the primary purpose for our lives. As is often the case, no one on their death bed says they wished they had more money or stuff in life. On the one year anniversary of Karen Armstrong’s Charter for Compassion (watch the video and sign it! ), may all beings know love and compassion for ourselves, each other, and our world. “Love is, in fact, an intensification of love, a completeness, a fullness, a wholeness of life. We not live merely in order to vegetate through our days until we die. Nor do we live merely in order to take part in the routines of work and amusement that go on around us. We are not just machines that have to be cared for and driven carefully until they run down. In other words, life is not a straight horizontal line between two points, birth and death. Life curves upward to a peak of intensity, a high point of value and meaning, at which all its latent creative possibilities go into action and the person transcends himself or herself in encounter, response, and communion with another. It is for this that we came into the world–this communion and self-transcendence. And this must not be confined only to sexual fulfillment: it embraces everything in the human person–the capacity for self-giving, for sharing, for creativity, for mutual care, for spiritual concern. And I might add, falling in love with the earth! Out of love for the earth, may we walk lightly upon her and care for all her creatures. May it be so. Gathering in circle to join our prayers for the healing our world through sacred art. Prayers were invoked for earth healing, for our animal brothers and sisters. Beauty. Unity. These photos were taken at the class held at my studio on Saturday. 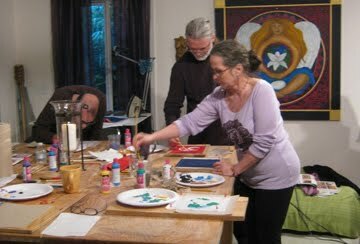 Coming together in circle to create sacred art is one of my greatest joys. Much gratitude to Sandy, Gretchen, Linda, Gary, Jon, and Jayna for their reverential and artful spirits. With a prayer for healing, my flags were hung this morning as seen at top. 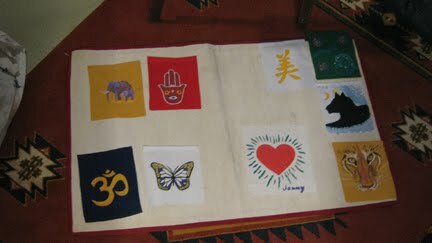 From left: Om, peace, love of the earth, inka cross, and beauty. May all beings know peace, may all beings be happy. For love of the EARTH!